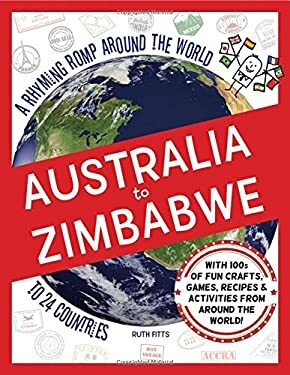 Readers will take a whirlwind romp around the globe with this eye-popping A-Z children s book exploring 24 different places around the world through memorable rhymes, gorgeous photos, detailed maps, and interactive activities. The facts are styled in a creative and accessible way that can be brought into each child s home through crafts, recipes, games, and recommendations for music and books. Activities such as how to carve like a Zimbabwean sculptor, how to play the Danish game of cooperative tag, how to make Turkish meatballs, and how to make a boomerang will be intriguing for all ages. The contributions from embassies, educators, and photographers around the globe bring an authentic flavor to this groundbreaking geography book, enabling readers to experience the sights, sounds, and flavors of each country. Also great for parents and teachers, this book offers an abundance of ideas for international festivals, creative festivals, and rainy days."